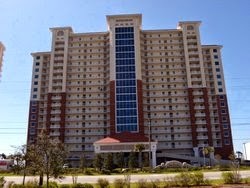 San Carlos Condominiums in Gulf Shores on the Alabama Gulf Coast offer the perfect beachfront property for a vacation home or real estate investment with benefits. The floor plans at San Carlos include 2-bedroom units that average 1200 sq. ft., 3-bedroom units that average 1400 sq. ft. and 4-bedroom units that average just under 1600 sq. ft. This Gulf Shores complex was completed in 2007 and is conveniently located to all the shops, restaurants and entertainment venues. Amenities include 1800 sq. ft. of meeting space with a full kitchen facilities overlooking the Gulf of Mexico beaches, ideal for weddings and family reunions. Plan a day in the surf, or enjoy relaxing at the large beachfront pool. San Carlos condominium also includes a complete exercise room with floor to ceiling windows, offering excellent views of the beach. This Gulf Shores Alabama beach complex has 142 condo vacation homes that make an excellent primary residence, vacation home or a great real estate investment with perks. Explore San Carlos and experience coastal living second to none! Browse Properties by Size & Price, View Photos, etc.